Power Game Online is a collaborative performance artwork produced for Resonance 104.4 FM as part of the Netaudio Festival at the Roundhouse. 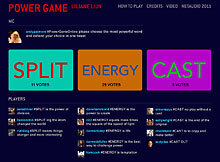 In its new digital incarnation, Power Game uses twitter feeds, and is viewable on a specially made web site where registered players and the MC are represented by their twitter avatars. Power Game on twitter no longer uses the gambling metaphor as in previous incarnations. Money is not needed to play the game and its rules have, therefore, been radically altered and transformed, focusing the entire content of the game on exploring the way meaning changes from individual to individual.